Born in The Haque, The Netherlands. 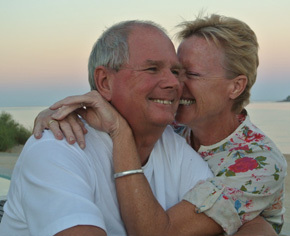 Been together for over 29 years, got married last Year (2010) in Malawi on our own Beach Resort. Both our careers have been with several luxury fashion houses, (Austin Reed, Burberry, Hermes, Harrods etc.) as Managers / Directors. Being closely involved next to Retail management with Customer Care & Customer Services. In 2001 the decision was made to stop the rat race and start to enjoy life under the South African Sun. After several trips through the African continent we came to visit Malawi and fell in love with its people, nature and its incredible lake. The outcome was to build a lodge on the lake side, European standards, but build with Malawians materials and build by Malawians, this was easier said than done as finding the materials such as bricks, wood etc, you need to have a lot of time and patience. The expression no hurry in Africa was something we needed to learn. One of the main objectives of the project is to support the local community and asses where our help is needed. The second objective is that all material used, need to be sustainable, i.e. the wood we purchase need to be replaced for the next generation, and new trees were planted in remote areas. One of the problems was the use of the hand made bricks, all the bricks we needed are burned by using local cut hardwood, so the only solution was to produce our own bricks made in a special designed mall and use a mixture of sand, termite soil and cement, a more expensive solution but at least no need / waste of fire wood. When we left South Africa, our friends Luuk and Chrisha donated all there carpentry tools for our project as we explained to them that we were disappointed in finding the proper quality window frames doors and general joinery (all what was used were big nails). So, we decided to build our own workshop in a small town 10 km away, in where we make all our own windows, doors and any wood work needed. The next good thing what came out of this ,is that we are now training young people to become skilled carpenter/furniture makers and supporting a small part of the community in this area. The attitude of the people we work with is a revelation, especially after working in so many different Countries.